A lot of people deride the practice of self publishing. But, as I noted a year ago, henceforth I would try to self-publish most of my new non-fiction volumes. That announcement led to the release of my first self-published book, Nothing To Do With Skin, which miraculously rose to the Amazon.com and Amazon.ca #1 on the bestseller list, due in large part to a large social media campaign and the addition of the book to my list of recommended (but not required) texts for my own Epidemiology students. Almost exactly one year later, the book crawled to the #1 spot on the bestseller list again. As a result of that success, I launched an official publishing imprint, Intanjible Publishing, that would brand all my future self-publishing efforts. On New Year Eve, under the Intanjible imprint, I re-released my first ever fiction book, first published in 1999 by TSAR Books in Toronto, Sweet Like Saltwater, and offered it for free for one day. It rose to the #2 spot on the bestseller list in Amazon.ca’s very competitive fiction category. Mind you, that was a little bit of a cheat, since a free book is not technically a “seller”. But I don’t care about the money; I care if people are accessing my work. 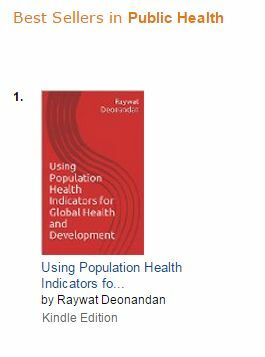 This past week, I published my third textbook (second self-published) and second Intanjible title, Using Population Health Indicators for Global Health and Development. The date was chosen to coincide with my trip to India, where I am now, and where I am part of a team delivering a one month institute on global health and development. In order to make the book accessible to the Indian students, I am allowing free downloads of both this book and Nothing To Do With Skin until May 26. 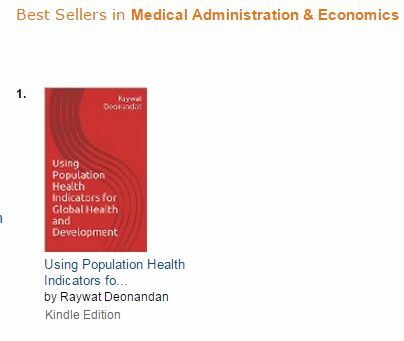 I am pleased to report that the overwhelming free download rate has pushed Using Population Health Indicators for Global Health and Development to the Amazon.ca and Amazon.com #1 spot in the categories of Public Health, Research, and Medical Administration & Economics. Meanwhile, Nothing To Do With Skin has taken the #1 spot for Epidemiology books for a third time. I know, free downloads do not equal a best “seller”. But whatever. I’m enjoying the ride. And more people are able to learn about Epidemiology and Population Health sciences. So it’s a win-win. I have a new title coming out under the Intanible umbrella in a couple of months. Stay tuned!